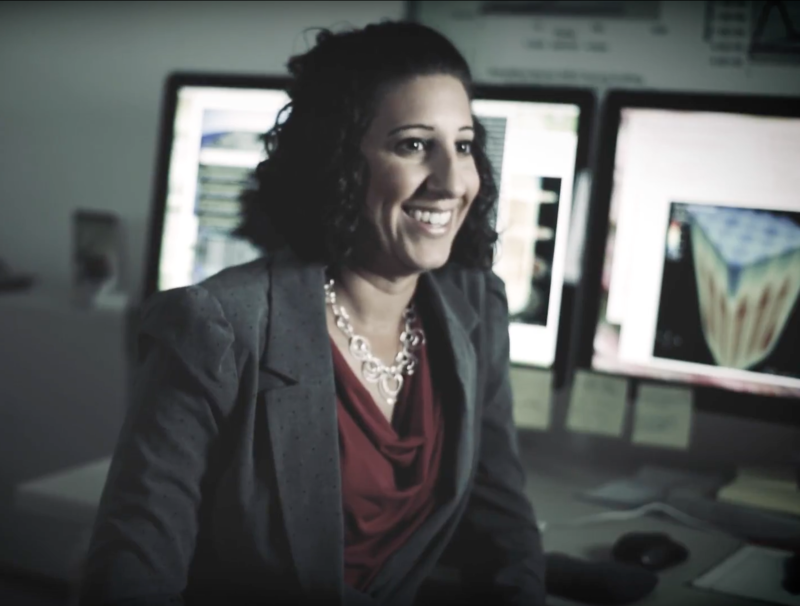 ORNL researcher Tara Pandya, who had an early interest in music, develops Monte Carlo and Deterministic radiation transport codes as a computational nuclear engineer. August 7, 2017 – Tara Pandya’s interest in nuclear engineering began with a literal flash of inspiration. Pandya originally aspired to become a musician or a music teacher, but grew to love math and physics the more she learned about them. When it came time for college, she wanted to find a program in her home state of Texas where she could combine the two fields. Texas A&M offered a nuclear engineering program that interested her, and it was during a tour of the school’s TRIGA research reactor that she saw the fateful demonstration of a “pulse” that would cement her fascination with the subject. She enrolled in Texas A&M for both her undergraduate and graduate education, earning her doctorate in nuclear engineering in 2012. She joined the Department of Energy’s Oak Ridge National Laboratory later that year as a postdoctoral researcher and transitioned in 2014 to a research staff position in the Radiation Transport group. Now, Pandya develops Monte Carlo and Deterministic radiation transport codes as a computational nuclear engineer in the lab’s Reactor and Nuclear Systems Division. When traditional methods fail to produce high-quality results, Pandya works to find new approaches or novel combinations of established methods to produce better answers faster and with greater confidence. She was originally drawn to computational, rather than experimental, nuclear engineering, she said, because it integrates the puzzle-solving nature of physics with the power of cutting-edge computer science. Pandya’s work has a wide range of applications, from reactor design and power generation to national security. She was named one of the Knoxville Business Journal’s “40 Under 40” in 2016 and won an R&D 100 Award for her work on the Virtual Environment for Reactor Applications technology with the Consortium for Advanced Simulation of Light Water Reactors. Simulation tools like VERA can generate answers for a variety of material, power and safety issues and provide vital insights into the operation of new reactors, such as the Tennessee Valley Authority’s Watts Bar Unit Two power plant. “Since we are simulating a lot of things that haven’t been built yet or are in the building process, a lot of people can’t grasp what we’re doing, so we need a way to be able to show what we’re simulating to someone who really has no idea,” Pandya said. “It is kind of empowering because you could potentially simulate whatever you want if you sit down and just think about the physics you want to capture. Pandya’s next big challenge is to prepare for the rollout of the Summit supercomputer and the formidable technical hurdles of the Exascale Computing Project. ORNL’s nuclear engineers normally run their code on the hybrid CPU and GPU architecture of the Titan supercomputer. Summit and next-generation computers, however, will have mostly GPU architectures, which cannot run high-fidelity nuclear codes. As a result, Pandya and other computational nuclear engineers must fundamentally change their algorithms to take advantage of future computing resources. Pandya’s biggest influences have been her advisors and team leaders who developed novel, long-standing methods of their own and encouraged her to do the same by bridging different areas of cutting-edge science and forging new connections. In an age when new nuclear systems can take decades to design and construct, developing powerful, useful simulations is a top priority, especially as the nation and the world look for modern solutions to future energy demands.